I wrote this story for the Dallas Morning News. It was published on March 1, 2004. PORT-AU-PRINCE, Haiti – U.S. Marines flew into Haiti on Sunday night, hoping to help bring order to a nation that erupted into chaos and murder earlier in the day when embattled President Jean-Bertrand Aristide fled into exile. U.N. Security Council members on Sunday night authorized an international military force for the country, under siege since an armed revolt broke out in early February. More Marines and French soldiers are scheduled to arrive today. Later, Canada, several Caribbean nations and possibly Brazil are expected to join in the effort. They would stay for up to three months, to be replaced by a peacekeeping force that would remain for an unspecified period. 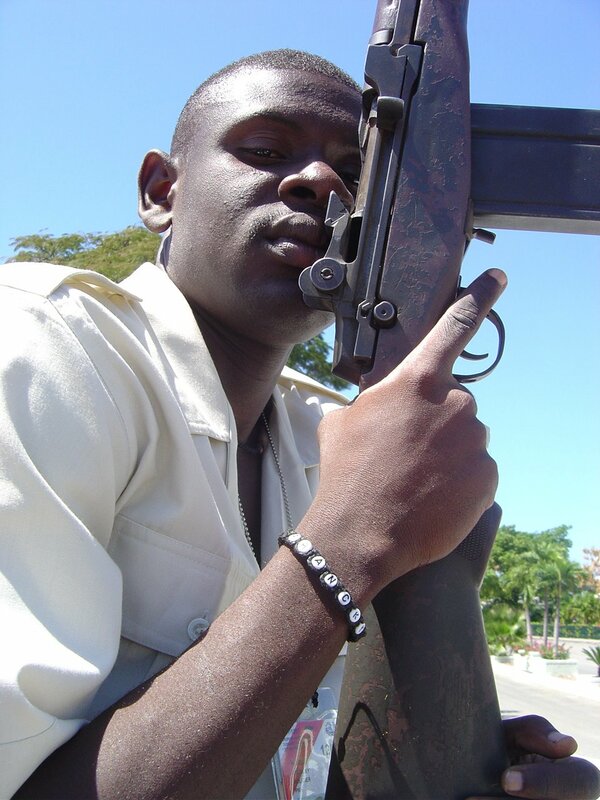 No matter, rebels rumbled into the capital aboard trucks Sunday, and gunbattles broke out with Aristide supporters. Thugs attacked passers-by, hijacked cars and torched gas stations. The number of dead wasn’t immediately clear. Plumes of smoke rose from a building near the presidential palace. Gangs stormed jails and prisons, freeing at least 2,000 inmates. They also raided police stations, grabbing all the guns they could carry. Mr. Aristide, 50, said publicly as late as Saturday that he would stay in power. But under pressure at home and abroad, he slipped out of the country aboard an executive jet at 6:15 a.m. Sunday, heading to parts unknown. Plans are under way for a transitional government. “There is finally hope for a better tomorrow,” said James Foley, the U.S. ambassador to Haiti. Mr. Aristide’s destination wasn’t clear, but initial reports said he flew to the Dominican Republic. The Haitian consul there said he was probably traveling to Morocco, but Morocco said it wouldn’t give him political asylum. He might be headed to South Africa, a U.S. official told The Associated Press. 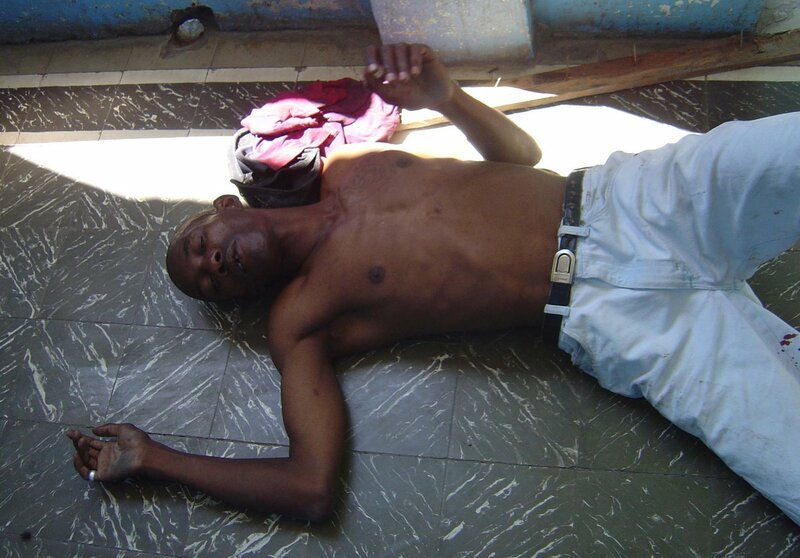 Mr. Aristide, a former priest, became a hero to Haiti’s impoverished masses in the 1980s after denouncing the murderous regime of Jean-Claude “Baby Doc” Duvalier, calling for social justice and surviving assassination attempts. But as president, critics say, he was autocratic, detached and failed to deliver. 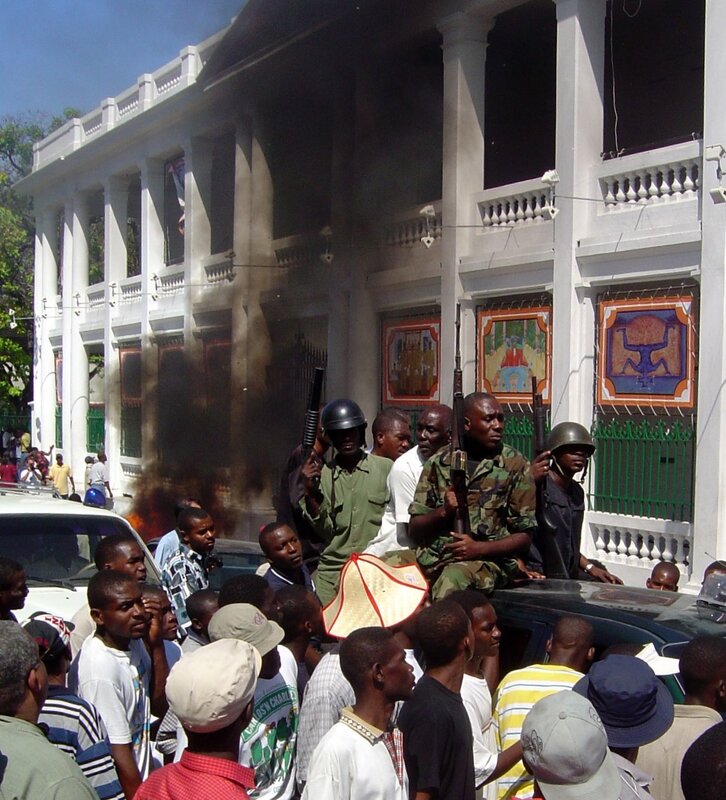 After his sudden departure, happiness, fear and violence swept through Haiti at once. But by nightfall, bodies littered the streets. Police pistol-whipped and shot looters, killing at least one man and injuring others, witnesses said. “I was walking downtown when the cop shot me in the leg,” said Reppert Selny, 18, grimacing. Not far away, a white Toyota pickup roared around a corner, then suddenly sputtered and stopped. Out of gas. “And we’re the only ones patrolling this entire section of town,” said an officer, one of six who piled out. Meanwhile, thousands of convicts, gang members and hard-core criminals were laying waste to Port-au-Prince, snatching up whatever they wanted and stomping, gouging or killing whatever got in their way. Gangs armed with shotguns and machetes set up dozens of barricades, using everything from furniture and mufflers to auto parts and old Texaco signs. They let some motorists pass. Others they shot. Looters streamed down streets pushing, pulling or carrying TVs, refrigerators, toys, boxes of shower curtains and bags of wheat. One man peddled stolen computers for 500 Haitian gourdes, or a little more than $11. 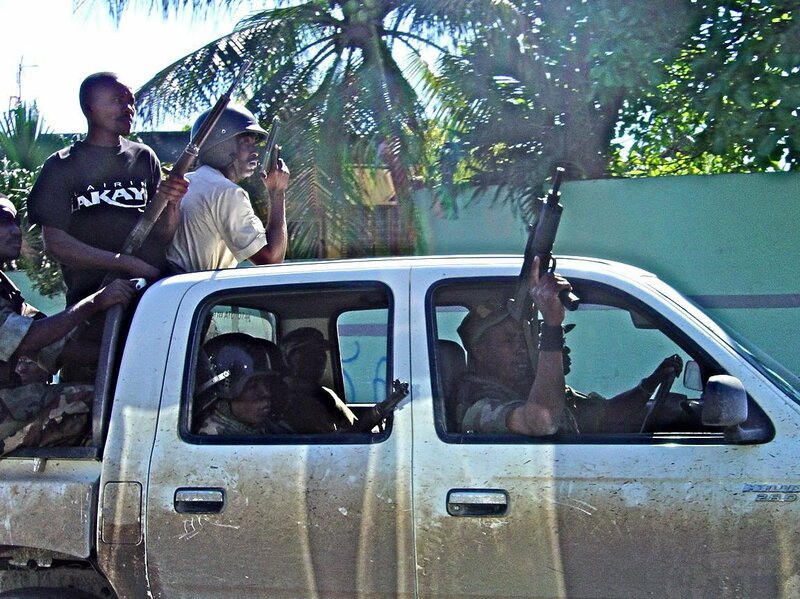 Bands of chimeres, the most violent of the ex-president’s supporters, raced around in trucks, looking for trouble. But even their foes were ready to fight. Jane Seifert, 56, was eager to leave. She stood with others at the Port-au-Prince airport, trying to board one of the three Hercules aircraft that Canada was using to evacuate its citizens. Ms. Seifert, a missionary, had no luggage or packages. She carried a single item: a shofer, a ram’s horn she bought in Jerusalem. Later, at the airport, police in the same white Toyota tore off after ruffians who had shot at a red SUV. They lost them and ventured onto another street and spotted a man who had expensive paintings stashed in his truck. “Did you steal these?” an officer asked, gun drawn. The police were unconvinced but let him go anyway. Elsewhere, even as shots rang out, many Haitians were optimistic.